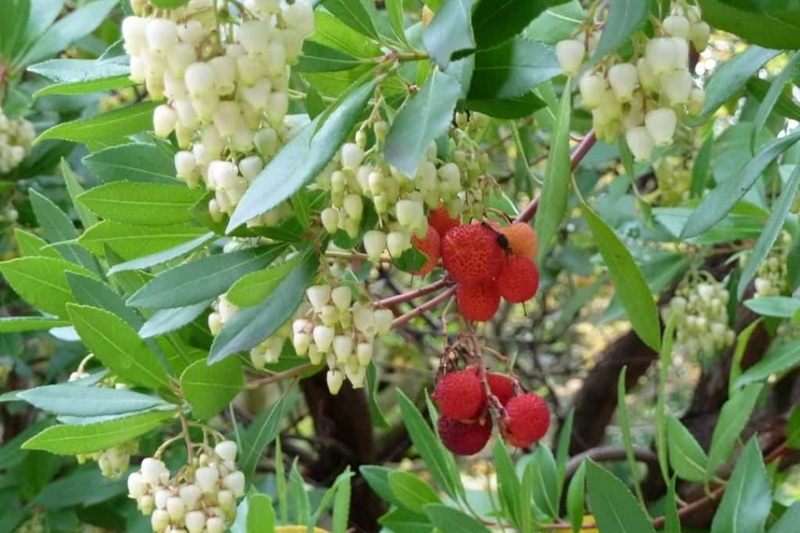 Strawberry tree (Arbutus spp. ): growing, planting, caring. The strawberry tree produces and edible red berries that aren’t strawberries. Confusing? Scientific name : Arbutus spp. Full description for Arbutus not yet available. Easy, it has peeling bark, white or pink flowers, fruit covered with spikes, and slightly toothed evergreen leaves. Plant the strawberry tree in the fall, in a rather acidic or neutral soil, well drained. Make a hole of sixty centimeters, and do not plant too big trees, to facilitate the recovery. Form a cup around the trunk, and fill it with water. For large subject, install a stake facing the prevailing winds. In pots, plant in a mixture of compost and sand, with a little bit of loam. You will only have to worry about watering if your strawberry tree is in a pot: outside of these conditions, it will manage on its own, or even withstand a dry soil better than wet soil. In pots, water every week in the summer . If you keep your strawberry tree in a jar, schedule replacing the topsoil with compost on the surface. The strawberry tree does not like to be trimmed, so only cut the entangled branches, and remove some inside branches around the heart of the tree to reveal its bark.